Last night we had our monthly student showcase, Satchel’s Shakedown!, and we had a great time as usual. There were performances by a group of students from Inna’s American Tribal Style class (one of which was accompanied by didgeridoo! ), as well as students from the Shambling Shimmies Improvised Tribal Style class, a wonderful duet from a couple of students, and solos from the instructors. There were even some excellent audience members that were kind enough to join us onstage and learn a couple moves during the audience participation part of the show! We were also honored to have a very nice person (Elise Giordano according to the photo credit) from the Alligator in attendance, and a photo from the show was featured in today’s edition! There was also a reporting student who interviewed a few of the dancers for a school assignment (whose name I have unfortunately forgotten because I did not write it down) – if you see this, email me using the contact link at the top of the page and I’ll update the post with your name! I definitely enjoyed speaking with her and am sure that she’ll get an A+ on her assignment. What a blast! You really should have been there – but don’t fret, you have another chance. The monthly showcase takes place on the last Tuesday of every month, and you can get details on shows and other events on our calendar or on the events listing for our fan page on Facebook. We hope to see you at Satchel’s! 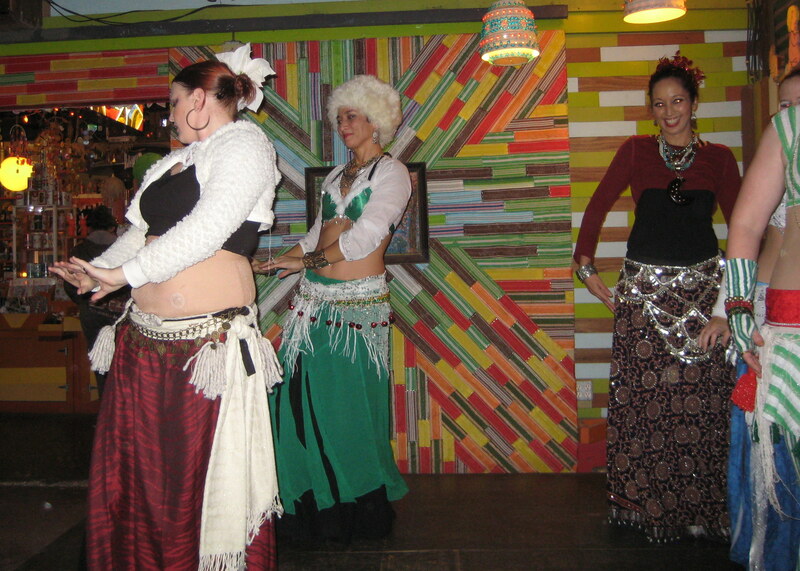 If there is anything Gainesville needs more of – it is belly dancing. 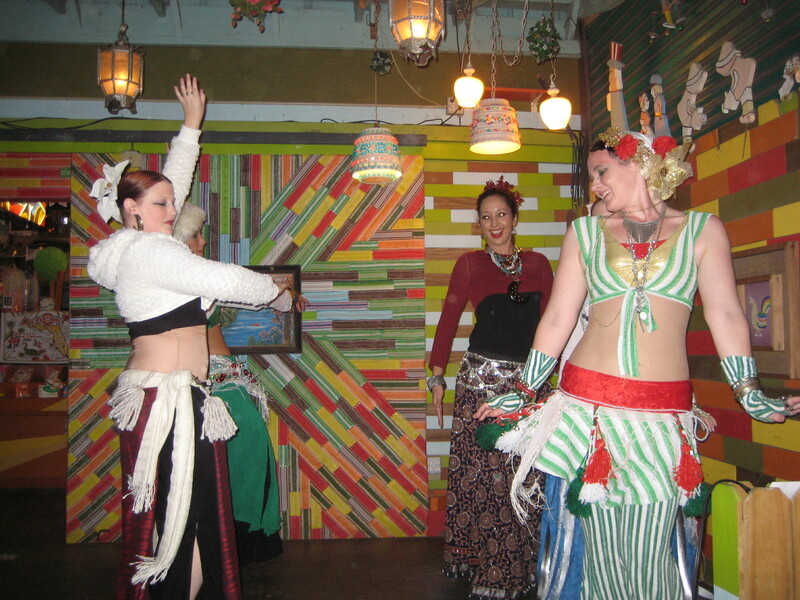 Luckily for locals, Lightin’ Salvage Enterprises is here to fill the belly-dance void with Satchel’s Shakedown [today] from 7:30 p.m. to 9 p.m. behind Satchel’s Pizza, located 1800 NE 23rd Ave.
Satchel’s Shakedown, hosted by the Shambling Shimmies Dance Company, brings belly-dancing entertainment to the popular pizza spot. 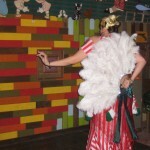 The event will feature performances by the Shambling Shimmies, the Swamp Daises and additional guest dancers. 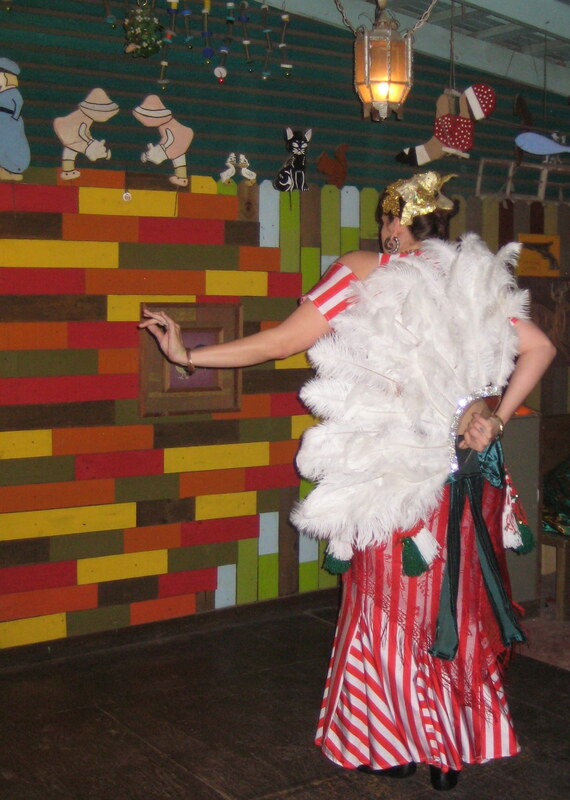 Open stage time is also available for guests who dare to show off their dancing skill. 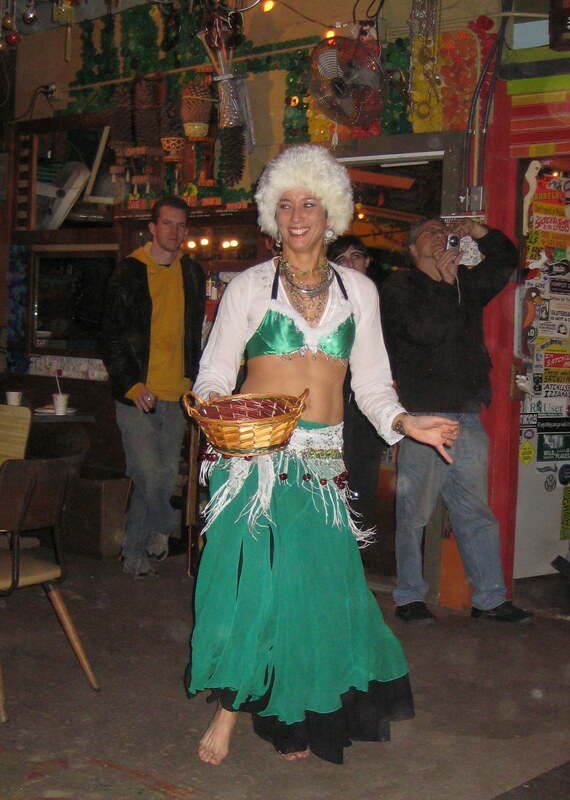 Danny Lore, event coordinator for Satchel’s, said a former employee who brought her dance class to perform at Satchel’s introduced the restaurant to belly dancing several years ago. “After it went down I asked her if she would just want to come back and do it once a month,” he said. The Shakedown continues to occur on the last Tuesday of every month, just like it did when it began. According to Lore the two girls who run the event now, Heather Fullen and Jules White, were students of the employee who started the Shakedown. 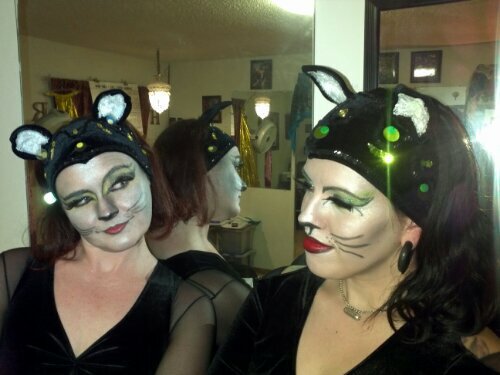 Fullen and White are the founders of the Shambling Shimmies Dance Company. 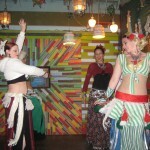 They began their business in 2011 with the aim of providing tribal and fusion belly dance classes and performance opportunities in the Gainesville area. 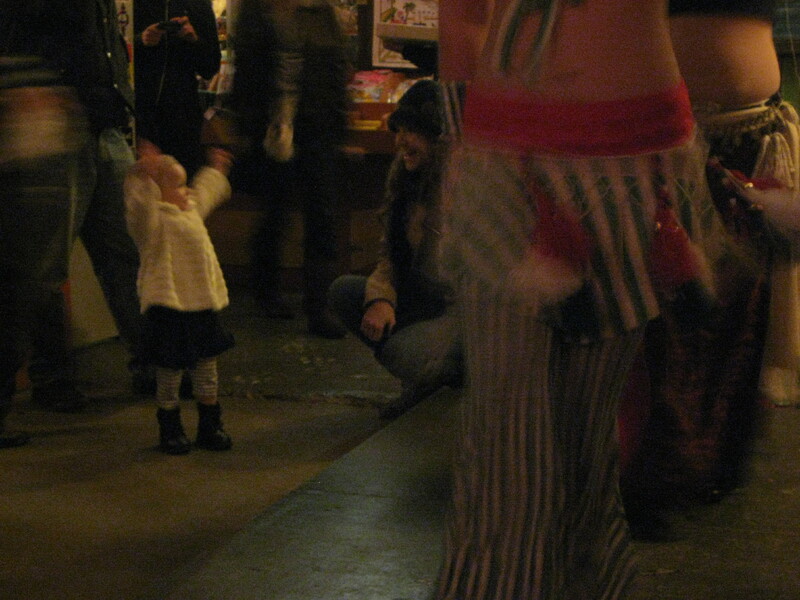 The Shambling Shimmies perform about once a month, Fullen said. Instructors normally dance along side the students as well. 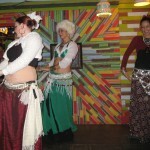 Fullen said at [today’s] Shakedown the Shimmies will present an Egyptian style belly dancer, tribal dance students and a cabaret style student giving her first performance. In addition to the Shimmies’ showcase, anyone bold enough can sign up for a guest spot and dance for five or 10 minutes. Lore said Satchel’s Shakedown, on top of being a popular event, has been a good way for new dance students to be familiarized with performing. Satchel’s Pizza is right there too, of course, with pizza and beer. Another reason to check out the Shakedown. Anyone interested in more information about Satchel’s Shakedown and the Shambling Shimmies, or looking to participate in the dancing can visit the event’s Facebook page at www.facebook.com/events/205829532889750/. Even if you aren’t interested in the workshops, we’d love to see you. We’ll be hanging out, jamming, shopping, and other fun stuff! 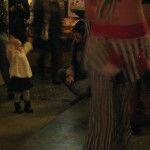 For our monthly show at Satchel’s for December, we had a bit of a holiday party! Everyone dressed festively, and we had a few sets with Christmas music. Tara & Kristin even did solos! These are a few of my favorite photos from the show! Check out our page on Facebook if you would like to see the whole album. 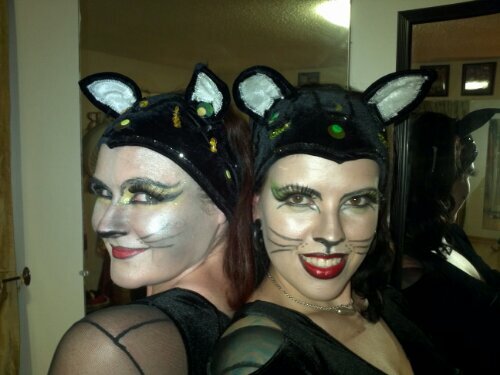 Julia and I also did a really silly duet (in honor of the upcoming New Year’s Eve). It was hilarious, even if I do say so myself. One can’t be serious all the time, after all. We previously have held pre-registered small group classes on Thursday evenings at 6 pm. These have been fun, but they’ve required students to commit to and pay for the entire course up front or by payment arrangement, and we thought that might have prevented some interested folks from being able to participate. So, for 2012, we’ve changed things up a bit! We’re still going to have a small group class at 6 pm on Thursdays, and it’s still going to focus on special topics, but it’s going to be a drop-in class! We’ll go through various topics (in segments of 2-6 weeks, depending on the topic and other factors). Please see the event calendar to see what topic is going at any given time – I’ve just put up the proposed schedule for all of 2012! 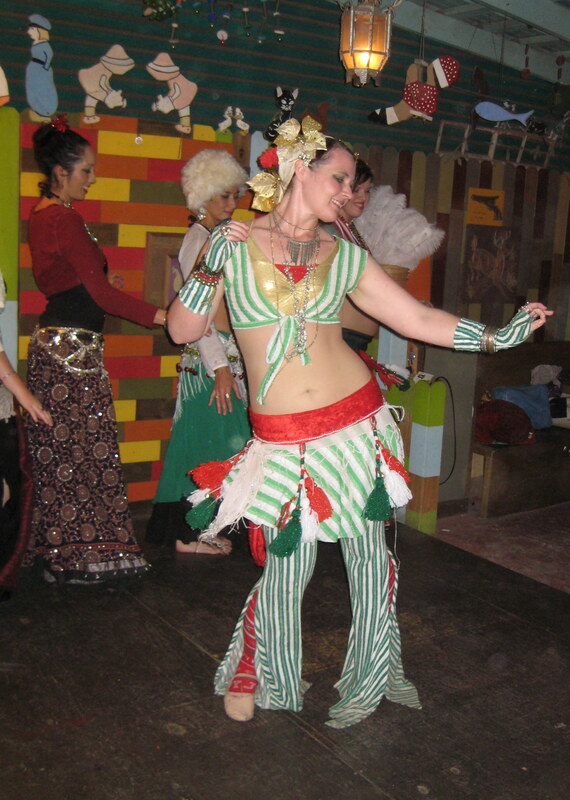 There are a lot of great things – veil, tribal improv with balanced props, tribal improv with fire props, zills, shimmies – all kinds of fun stuff! The class size will still be kept at 6 people or fewer (if we are blessed with a crowd, we’ll split the special topics into multiple classes), and the price will stay comparable to our small group focused courses. The big differences are that you can drop in on single classes, you don’t have to pay in advance, and you can use your class card (which means you get to take advantage of bulk discounts on class cards). Special topics classes that involve fire will be $20 per (or 2 punches on your class card). In addition to the small class size and dual instructor format, we will be providing props to borrow if you don’t have your own, an outdoor space for lit practice during class (once enough material is covered), as well as fuel and safety equipment/monitoring. The class is also just a smidge longer to allow time for preparing and cooling down props, etc. Special topics classes that do not involve fire will be $15 per (or 1.5 punches on your class card). These will have the usual small class size and dual instructor format. There will be props to borrow if you don’t have your own for veil, basket, and zill classes. The special topics classes also include performance opportunities at our monthly student showcase at Satchel’s, and at haflas held at the studio. We are excited about the new opportunity to study special topics on a drop-in basis, and hope to see you there!